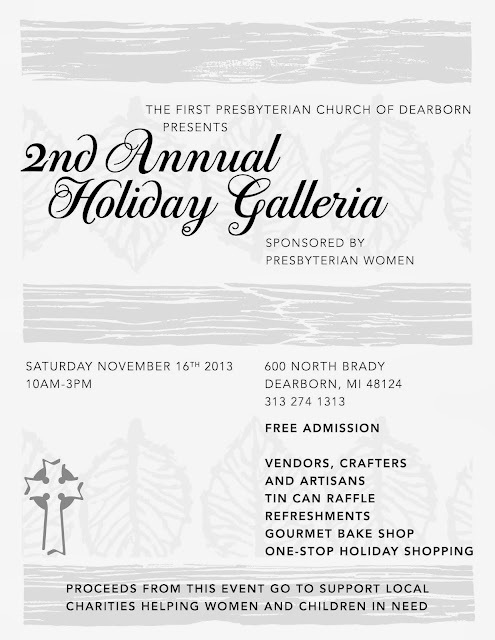 This Saturday, November 16, from 10am-3pm, you'll find me at the Holiday Galleria in Dearborn. Held at the First Presbyterian Church of Dearborn, this is the events second year. I really enjoyed doing it last year and I'm sure I will again this year. They have a wonderful selection of diverse gifts (as many local craft shows and artisan markets do), but this event offers another important plus -- all of the money that the Presbyterian Women (the ladies who run the show) raise from this event goes directly into their fund that supports charities for women and children in the Metro Detroit area. You can get your holiday shopping done and help the many women and children in our communities who need your assistance and support at the same time! Not a bad way to spend the day, or your money. Last week I was working on crocheted boot cuffs (leg accessories), this week I've switched to crocheted fingerless mitts (arm/hand accessories). I was quite happy with the way these granny square mitts turned out. I saw some fingerless mitts in the Sundance catalog that I really liked, and decided to see if I could make something similar. These granny square mitts were what I came up with. This next pair of mitts is a bit more on the "lady like" side. They have kind of a lacy, ruffled look, and they are more close-fitting. I wish I had time to share more, but things are just crazy!! I am trying to get ready for the Lindbergh Holiday Boutique this Saturday (November 9, 2013), and things are really gearing up for the holidays at Art Is In Market, where I also sell my work. In fact, their holiday kick off is also November 9. I am spending every minute I can with hook in hand. Art Is In Market provided me with some new display shelves. They're from Ikea. My daughter, Betsy, helped me put them together and set them up last weekend. I think they provide a more clean, polished look for my store display. Time to get back to crocheting!